There are few things we appreciate more than a decadent NYC wedding cake both in taste and style. Dessert tables may be on trend right now, but nothing compares to a mouthwatering confection that delights more than one of your senses. That said, we’ve rounded up 50 tantalizing cakes that promise to do just that. Our favorite kind of NYC wedding cakes is the kind that makes a statement by adding to your NYC wedding decor. 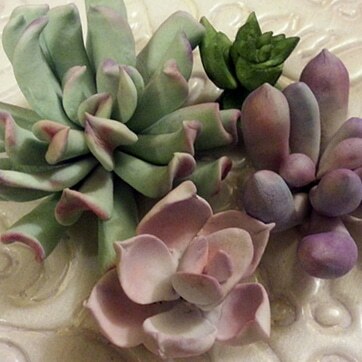 For bohemian brides, we’re loving succulent touches, geode designs, marble patterns, or anything with an earthy feel. If your style is more contemporary, a sleek, smooth finish and geometric details, such as a repeated tile pattern, hexagonal tiers, or triangular adornments, will always do the trick for your nyc wedding cake. If you’re more of a classic bride, traditional white isn’t your only option; hand-painted florals, watercolors, and subtle ruffles all evoke a timeless touch. And no matter the cake style, gilded accents and metallic foil always add a hint of glam and a dash of chic, while greenery, whether a topper of eucalyptus, cascading foliage, or wreath of ferns, brings organic beauty. If your reception is outdoors, take inspiration from your surroundings for your nyc we. A festoon of fresh blooms is a chic way to infuse some garden whimsy, fondant oyster shells and watercolor blues bring in some coastal charm, and semi-naked cakes take cues from the rustic elegance of the woods. 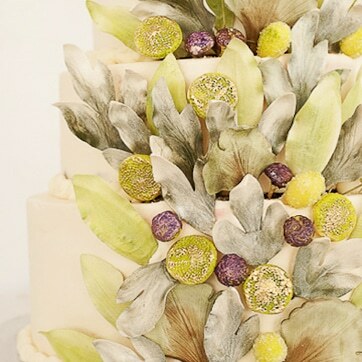 The seasons can also serve as a solid source of inspiration: Light pastel flowers are a standard for some springtime flair, a bold-colored drip cake serves up some summertime whimsy, rich, moody hues are ideal for an autumn affair, and icy blue and white details mirror the coolness of a winter wedding. City Sweets is a couture cake art studio that specializes in creating beautiful, delicious and unique wedding cakes. we are where art and cake connect. At an ancient Roman wedding, a barley cake was eaten by the groom with the remnants broken over the bride’s head to symbolize her fertility and his dominance. In today’s times, it is usually the happy bride who is in control of her own wedding cake! delicious wedding cake they’ve ever had! Our wedding cakes are covered in fine imported Swiss fondant. We use Valrhona chocolate because we believe that a chocolate cake or buttercream icing should taste like real, rich, decadent chocolate, not the color brown. We use vanilla from Madagascar because we think it tastes the best. We use butter with a high butter fat content so our cakes stay moist and delicious. We use oils, not extracts because we feel they yield a much more delicious result. Our buttercream frosting is most popular for good reason! Lovingly made with sweet butter and pure madagascar vanilla, real dairy products give our buttercream its pale, yet warm, ivory tint. Whisper light and naturally delicious, this creamy frosting is the perfect complement to any wedding cake or confection. Our cakes are first iced in buttercream to create a perfectly smooth surface for the fondant. 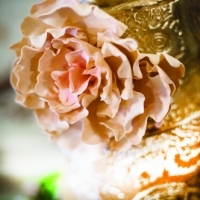 Our hand sculpted sugar flowers are often mistaken for the real thing. All the flowers you see in our portfolio are made from sugar. We can create any flower in any color to match your bouquet, centerpieces or vision. Sometimes our cakes are simple, classic, modern or contemporary with just a single giant sugar peony. Sometimes they’re lavishly embossed and gilded silver, pearl or even gold with a variety of cascading sugar flowers from top to bottom. Sometimes they’re neither of these. There are absolutely no rules when it comes to wedding cakes any longer. The tradition of the all-white vanilla cake has long faded away, leaving room for whatever it is that will make your heart happy and complement your wedding perfectly, in both style and taste. With over 50 flavors to choose from, our vast menu has flavor favorites for everyone everywhere.